Calls are the oddest things. Sometimes you need an up market to get good premiums. Other times, like this week, you can get good premiums during a down trend. You should not sell calls on your coveted income stock willy nilly. You need a reason. Sell calls on stocks when fundamentals such as D/E (debt to equity ratio) change. Sell calls on stocks when EPS (earnings per share) are less than the dividend even when the dividend increases are substantial. Sell calls on stocks that pay yield less than you can get from a 10 year U.S. Treasury. Below are three calls I sold today. Each one for a different reason. I think Home Depot is a much better product than Lowes. However, Home Depot carries a high debt load. The balance sheet hawks will argue that HD has the cash flow to service the debt and they are correct. HD has an interest coverage ratio of 13.51 according to MSN Money and verified by Gurufocus. For those of you new to terms like interest coverage ratio, see the link below which explains it well. The interest coverage ratio is a debt ratio and profitability ratio used to determine how easily a company can pay interest on its outstanding debt. The interest coverage ratio is a debt ratio and profitability ratio used to determine how easily a company can pay interest on its outstanding debt. My readers know, I just don't like stocks with big debt. All you need a precipitous drop in free cash flow to render the company a troubled asset. I am cautiously holding HD. I have no reason to think they will suffer a major disruption of business that would make them lose significant value or even go belly up. With a yield of only 2.07% and a P/E (price earnings) ratio over 25, I am not afraid of losing HD. I see selling a call on this stock an opportunity to boost my income. This is not a risk free move. I am contractually obligated to hold the shares on which I sell a call. I could get stuck with a stock that goes down, but again, I do not expect this to happen during the 57 days before the call expires. 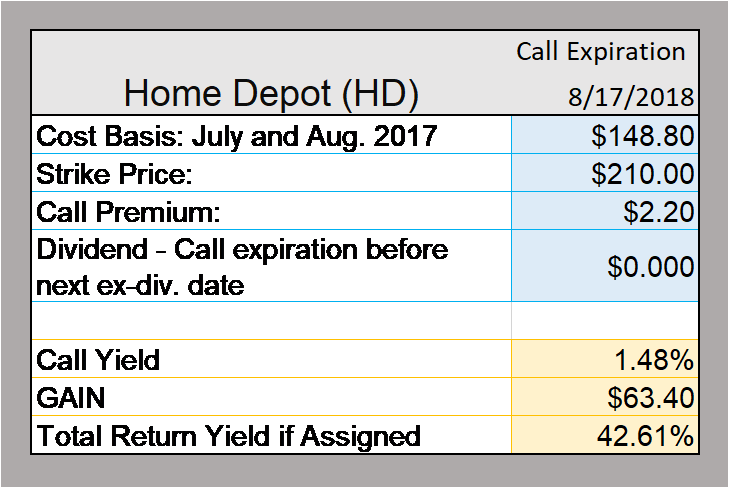 In summary, I am selling calls on HD hoping the call buyer will take my shares. I will have booked good income from the call, the dividends, and then I can reinvest the capital into a higher yielding stock with better fundamentals. Amgen is another stock with a D/E ratio (debt to equity) the is a bit high at 2.27. However, it is not uncommon for a bio tech stock to carry high debt. It costs a lot to develop new drugs. Amgen's yield is almost 3%. That is marginal. Yet they increase the dividend vigorously. Too vigorously for my taste. Over the past three years dividend increases have averaged over 22%. The problem is earnings. Again my readers know I need a stock to create more earnings per share than they pay out in dividends. 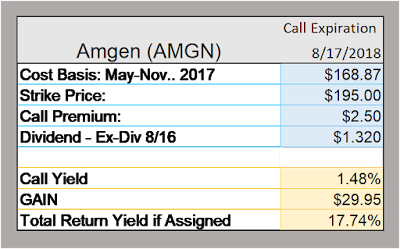 Is AMGN using their debt to increase the dividend or to develop drugs? Earnings are $3.03 with dividends paid out $5.28. I am not afraid of losing AMGN. I have a solid gain and have booked the dividends and multiple call premiums. I would like the call buyer to take my shares. 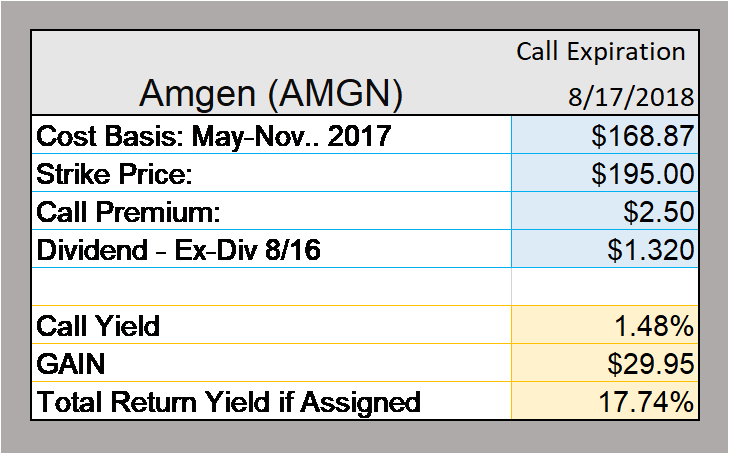 Look at the price chart, AMGN could very well go above my strike price and the call buyer may take it. I hope so. Apple is a very good company. It does not have any of the trouble noted above with HD or AMGN. Apple is stuck in a trading range that has not broken above $200 at least during the last 5 years. See the price chart. 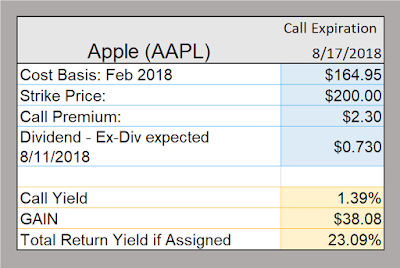 I am selling calls on AAPL because I own a lot of apple and the yield is low. I need to get 5% or more of income on my invested capital. Calls provide that income. If I lose these shares, I have more in my pocket. 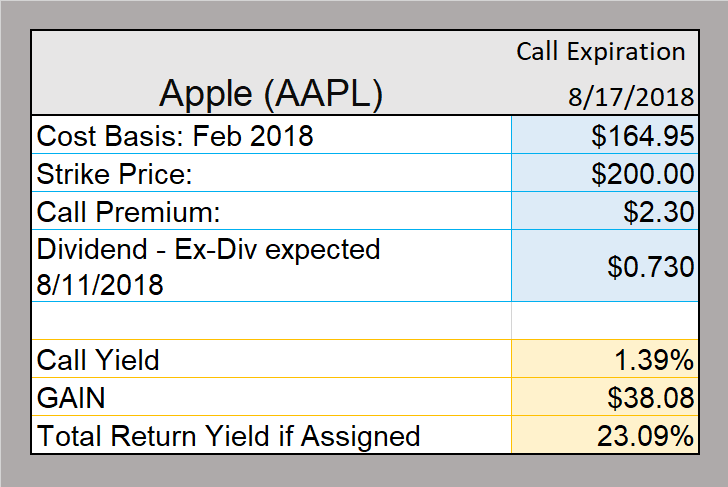 Basically, I am selling calls on Apple because I can.